Obituary – Johndrow, Melvin Ray « Perry High School Alumni Association, Inc. The United States navy already has a first option on the next few years of the life of Melvin Ray Johndrow, 18-year-old graduating senior this spring at Perry high school. The son of Mr. and Mrs. Leo L. Johndrow of route two, Perry, Melvin enlisted March 26 this year in the U.S. naval reserve as an apprentice seaman and plans to enter training as an aviation cadet. He has lived in Perry for three years and attended one year at Hunter high school. He was born in Hunter and also attended grade school in Garfield county. A member of the 1942-43 wrestling squad, Melvin placed second in regional tournaments for the 120-pound class. 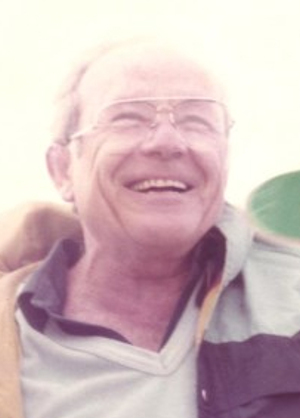 Melvin Ray Johndrow passed away at his home in New Bern, NC on July 23, 2012. Born in Hunter, OK on April 13, 1925, Melvin grew up on a farm near Perry, OK, where he wrestled on the renowned Perry High School wrestling team and graduated in 1943. After graduation, he enlisted in the US Navy and attended college at the University of California at Berkley, where he graduated with a business degree in 1947. While at Berkley, he married his high school sweetheart Virginia Wilson of Garber, OK. They were married in a friend’s home overlooking the Golden Gate Bridge in 1945. Mel and Virginia returned to Enid, OK to begin a 42 year career with the JCPenney Company that carried them through Shreveport, LA, Jackson, MS, Atlanta, GA, Norfolk, VA, and New Bern, NC. Melvin opened the New Bern JCPenney store at Twin Rivers Mall in 1979, and retired in May of 1989. Throughout his life he loved traveling, camping, fishing and crabbing. He spent much of his retirement enjoying the waters around Swansboro, NC. Melvin is survived by his wife of 66 years, Virginia Johndrow, son Jack Johndrow and wife Kim of Advance, NC, daughter Jenny Johndrow and husband John Chilton of Portsmouth, VA, son David Johndrow and wife Nancy of Raleigh, NC, and son Jon Johndrow and wife Marcia of New Bern, NC. Also surviving are granddaughter Heather Murphy and husband Scott of Chesapeake, VA, granddaughter Caroline Johndrow of Raleigh, NC, and greatgrandsons Noah and Will Murphy, of Chesapeake, VA. Melvin is also survived by sister Enid Heppler and husband Bernard of Perry, OK and brother Robert Johndrow and wife Veda of Winfield, KS. Services will be held July 26 at 2:00pm at Cotten Funeral Home, 2201 Neuse Blvd., New Bern, NC. Family will receive friends one hour prior to the service. In lieu of flowers, donations may-be made to Community Hospice Foundation at chchfoundation.org, or the National Parks and Conservation Association at npca.org.